IS SATURDAY SABBATH ACCORDING TO GENESIS 1:14? YES OR NO? One of the most visited topics in these last days is prophecy and how desperately important that topic is to us living at the end of time. As many can speculate between one topic or another as to what each prophetic symbol means in the scripture, there is one topic that is not only very important but is also crucial for us to understand. That topic is the signs in the sun, moon and stars spoken of by the Prophets of old and the Messiah when He was here with us on Earth. You may ask why out of all topics, that one would be essential? This article will open your understanding to our Creators calendar and its importance in coming events. If you open your Bible to the book of Matthew chapter 24, you will find that the Messiah YAHUSHUA stated many things that were going to take place before his return. We will begin by examining a portion of that chapter and the most profound, yet overlooked, statements in it. Immedialty after the tribulation of those days shall the sun be darkened, and the moon shall not give her light, and the stars shall fall from heaven, and the powers of the heavens shall be shaken: and then shall appear the sign of the son of man in heaven: and then shall all the tribes of the earth mourn, and they shall see the son of man coming in the clouds of heaven with power and great glory. What most people miss in those 2 verses is priceless information. Beginning below, we can take apart these 2 verses and find a multitude of information relevent to coming events in our lifetime, as the analysis below of the verses will show with a cumulative summary following. 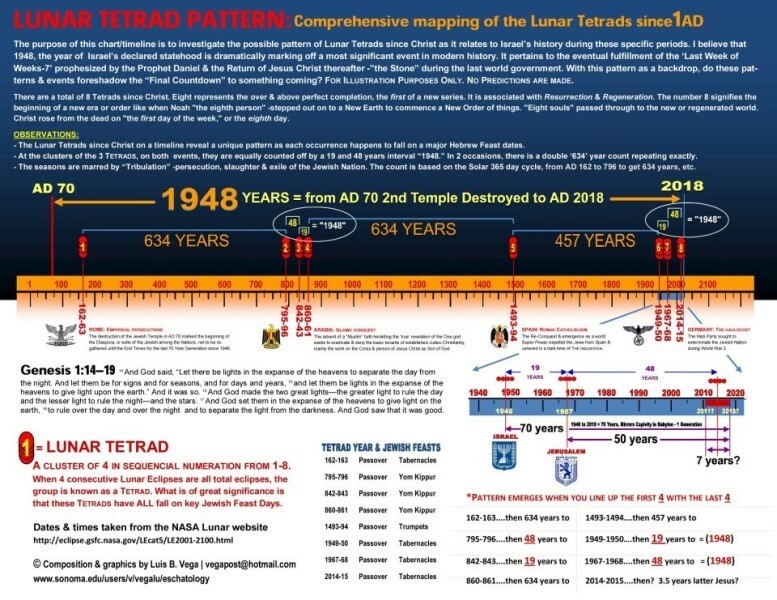 We are given defined markers/signs in the heavens, the same ones created in Genesis 1:14 to do just that be used for signs/appointed times of worship/seasons which comes from the Hebrew words in Strong’s Concordance H4150 (﻿מעד﻿=﻿MOED﻿﻿﻿﻿) and H226 (﻿אות﻿=owth), as they are pointed out as definite objects. The Messiah directly stated that these signs would be visible, literal points of reference; therefore, His words were not to be taken as a figurative object lesson or parable statement, but literal fact. We find within the verse that the sun will be darkened. From a simple understanding in astronomy, it can be understood that this will be a solar eclipse, because when a solar eclipse takes place the sun is darkened. We also find that the moon will not give its light. There is a simple explanation for when the moon does not give its light and that is called a lunar eclipse. It is when the moon becomes a dark, blood red color during the eclipse by which it does not reflect properly as it would in a normal lunation. We find that stars/meteors/asteroids will fall from the heavens onto the earth. Stars, being plural, means that we should look for many. From the following 4 points, we can place together the following scenario in which a solar eclipse takes place, followed by a lunar eclipse, followed by a meteor shower all in succession of each other., On May 19, 1780, northeastern America experienced a day of extraordinary darkness followed by a blood-red moon that night. On November 13, 1833, a spectacular Leonids meteor shower occurred. These three events were thought by many to be a fulfillment of Revelation 6:12, paving the way for the final events of history by many. This was also looked at as a fulfillment of the 1260 day prophecy of the book of Daniel. Before we continue, we need to take a brief look into history and then move forward to today so that we will find some important details of events gone by, events to come and how it all ties together. We must first begin in 1844. After what became known as the great disappointment, later turned out to be an eye opener to many because people started to understand that the Creators Luni-Solar calendar is different from the Papal Roman (BEAST) solar Calendar.A fufillment of Daniel 7:25, the Roman Calendar has attempted to change the Creators appointed times/laws and cause the world to wonder after the beast power in Rome fulfilling REV. 13:3. The Creators Calendar is written in the heavens and it cannot be tampered with by Satan. People began an awakening process that continues today. The Creator’s Calendar is what we should be watching and using as a guide to some coming events. 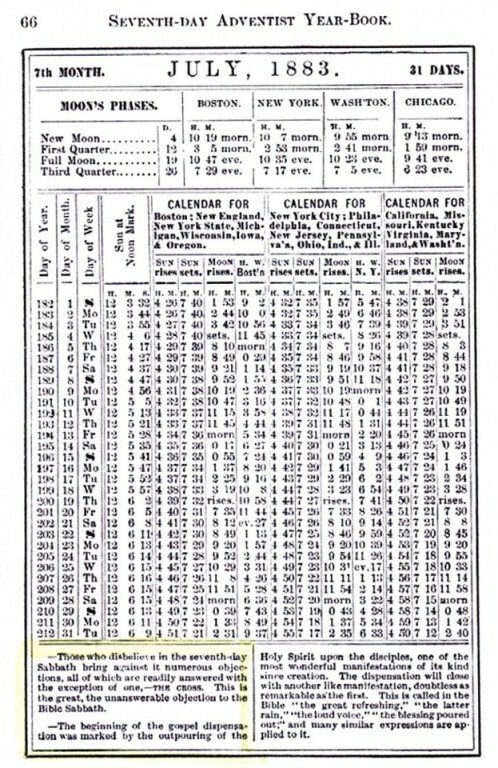 The Creators Clock is precise and easily observable to the point that William Miller found how to count back to the crucifixion of the Messiah, by going off the creators calendar. He could also count the prophecies of Daniel from fixed points in history as displayed below. It was from William Millers dedication and hard work that he was able to demonstrate to the world how the prophecies recorded by Daniel, the prophet, could be counted using the decree to go forward and build Jerusalem and that counting forward brought the count to 1844. By doing so, William Miller was able to prove long ago many things that scientists are now beginning to come full circle to and that being the calendar used to find the passover in the days of Messiah is definitely not the pagan calendar in use today. As of 4/18/2011 an article was produced in London, England explaining that the crucifixion would have had to occur in the middle of a Gregorian Calendar week; therefore, totally destroying the notion that a continuous Saturday or Sunday on a purely solar calendar would qualify as a constant confirmed Sabbath. The events concerning the Messiah would have taken place earlier in the week by going off the Creators Calendar therefore proving they are not one and the same. To add to a fact already established, looking back and still today, the Adventist movement have clearly stated that there is still one problem with a Saturday Sabbath. The same scenario plays out as above with the Sunday Sabbath believers and, that is the unanswerable question of the crucifixion of the Messiah. In the years that followed Millers reasearch the SDA church leadership that was faced with a possible World Calendar movement had to evaluate Millers claims and others. With the truth in hand, they could have made an immense difference but instead, chose to hide a light that could have shined bright. The Grace Amadon collection clearly shows that one of the worst coverups in history did not occur only by the Roman Catholic Church, but also by those claiming to be Sabbath keepers. By observing Saturday as the Sabbath on the Papal Calendar, the SDA church became one more to go home to Rome and wonder after the beast. After doing so it left a dark cloud over many truths as to restoring the Creators Calendar, until many truths began to surface again by many of those who had studied the word. These two portions of information are the key to unlocking many things in scripture. It shows that the Roman Catholic Church, attempting to change the Creators times and laws proves her to be the Anti-Messiah and that by observing the movement of His clock in the heavens, we can find his Sabbaths and the signs to come which are stated in Matthew chapter 24 by the Messiah YAHUSHUA. 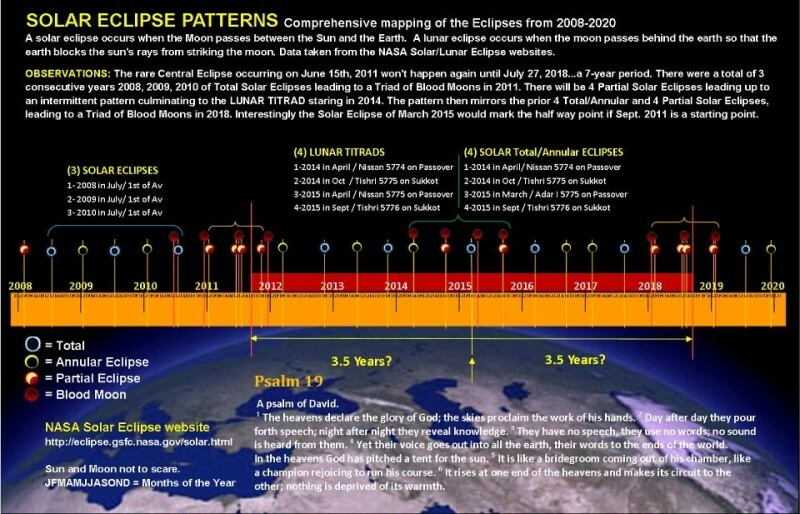 Moving forward to present time, many are presenting these truths to the main stream and all over the world, Pastor Mark Blitz being one of them at the forefront has brought forward that the Tetrad of eclipses that will occur between 2014 and 2015 are very significant. They will happen during the appointed times/feasts of YAHUWAH on His calendar, ordained in heaven. While most will be wondering after the beasts false calendar, there will be events happening in the heavens that cannot be over looked or brushed away as accidental. Many, including NASA could put this information in greater light, but they more than likely will not. The fact that when these events have happened in the past, Israel became a nation state and other events concerning Israel took place is nothing to try to explain away either. With these events moving closer every day we need to awaken our senses and be ever watchful for the trumpets of Revelation to begin being sounding out on humanity if this is the signs of Matthew chapter 24. This is the oppurtune time to wake up and come to life in Messiah and his Fathers Word. Now is the time to restore the foundation of many generations. Now is the time to Follow the Creator and observe his Sabbaths, so that you do not recieve the mark of the beast one day soon, and of the many plagues to be poured out.